It seems like forever since I have written a post! I was not planning on taking this much time off from the blog but I am back and for the most part refreshed. I hope everyone enjoyed the Holidays. We played it pretty low-key this year. It was just the four of us and the hubs got to take a bunch of time off so we were fortunate to get a lot of family time in. It was pretty great. The only bump in the road was when Mace got sick on New Year’s Eve because somebody let him have too many cookies. I won’t name any names, he knows who he is. These are the cookies we made on New Year’s Eve. I tried a new cookie recipe this year and they turned out pretty good. Just ask Mace, he ate most of them. Take note of the last picture. This is all the cookies he left for the rest of us. Upon expressing my concern about said cookie consumption, the hubs assured me it was fine and that Mace did not eat that many cookies. Mace ended up telling on his daddy by projectile vomiting on my couch, in the kitchen, down the hallway and all over the hubs and myself. He continued vomiting throughout the night and into the early morning hours at which point the hubs rolls over and tells me, I think I’m at my limit, we, (Seriously?) can’t let him have any more cookies. The hubs gives sage advice. I’m so glad we took it. Anyway, we were able to get a few hours sleep after my little guy’s tummy finally calmed down. By the time everyone was up and going, it was already well into the afternoon and most of us were starving. Needless to say, I wasn’t going all out after the night we had but I needed something warm and comforting. The original plan was to have leftover Almost Risotto with Sausage and Mushrooms, but we quickly gobbled up every last morsel of that dish, so I threw together these Red Potatoes with Sweet Peppers and Onions. Better known around here as Potatoes O’Erin, (sage advise giver and a marketing genius, I am one lucky lady). It was exactly what I wanted. The potatoes were soft and creamy inside and brown and crispy on the outside. 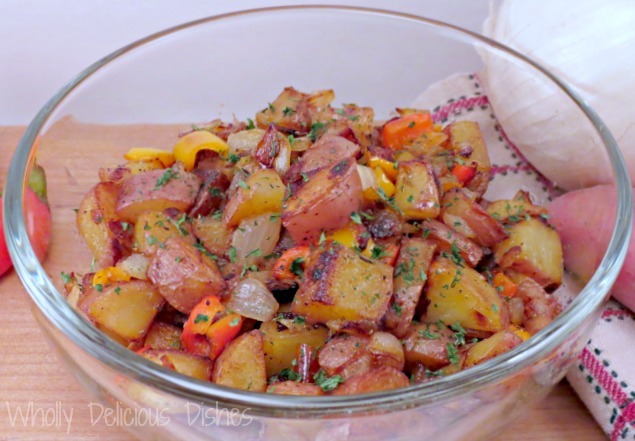 The peppers and onions added a little sweetness and you know, peppers and onions just go with potatoes. Plus, this dish only used a handful of ingredients, was ready in about 20 minutes and left me only one pan to clean up. Bonus. 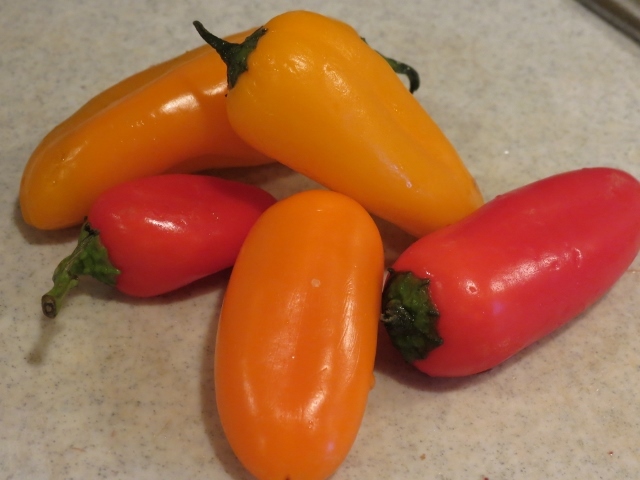 I had to buy these sweet peppers because they were so cute. They are actually pretty tasty and I ended up using them in a couple of different recipes. It makes me happy that something that tastes this good offers so many nutritional benefits. Namely, vitamins A, C, E, K, B6 and folate. Now if I could only get my kids to eat them. 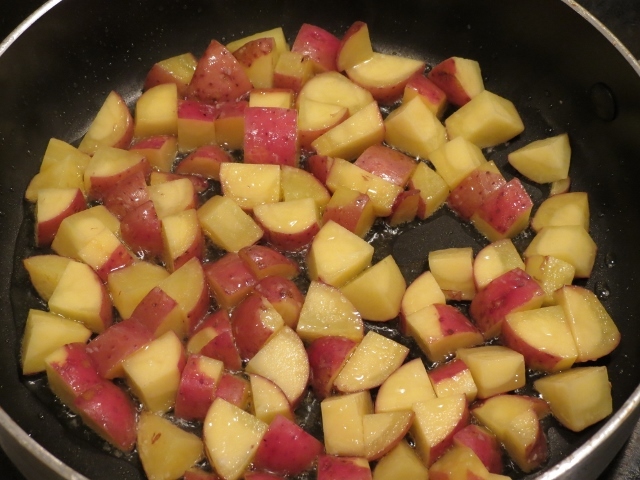 Heat your oil in a skillet and add your red potatoes. 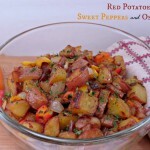 I usually use russet potatoes in a dish such as this but I was glad I decided on the red ones. They offered a little more sweetness and were creamier. I had to leave the skin on, peeling red potatoes seems unnatural. Leaving the peel also served as another time saver, and gave us a little extra fiber, too. 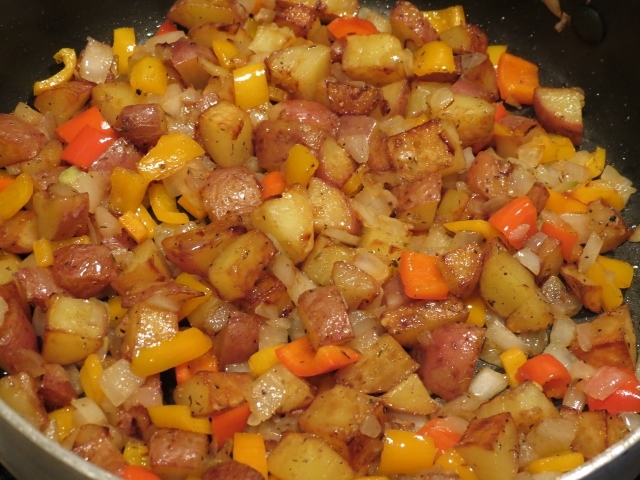 After your potatoes have browned and crisped up on all sides, throw in the sweet peppers, onions, garlic, coriander, thyme and salt and pepper. Cook until the peppers and onions start to soften. Done. You are ready to serve them up in all their sweet and crispy gloriousness. I thought I was going to be real cute here and make up a new word but apparently, gloriousness is for real. How ’bout that. These potatoes would be great with an over easy egg and some toast. I would have done this myself but then I would have another pan to clean and that wasn’t happening. You could also use this as an accompaniment to any number of meals. Like a nice steak or chicken. I would throw these potatoes on top of some romaine with croutons and mushrooms and eat it for lunch, maybe a little ranch dressing. That’s not weird, right? How would you serve this dish? Add the peppers, onions, garlic, coriander, thyme and salt and pepper and cook until the peppers and onions start to soften, about 5 minutes. 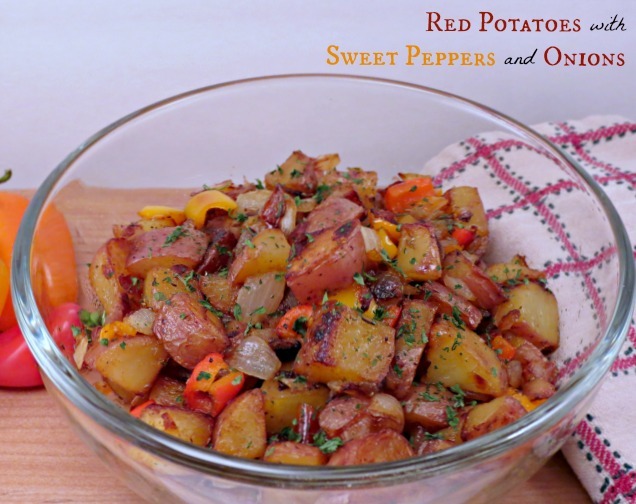 Serve piping hot for breakfast or as a side dish.